Easy roasted potatoes with garlic and rosemary is a delicious side dish that can accompany almost any meal. It is wonderful with a piece of grilled steak or chicken or next to a light green salad and quinoa. All you need to do is chop the ingredients, mix, and pop them in the oven (let it do all the work). This recipe calls for dried rosemary but if fresh is available opt for that instead. 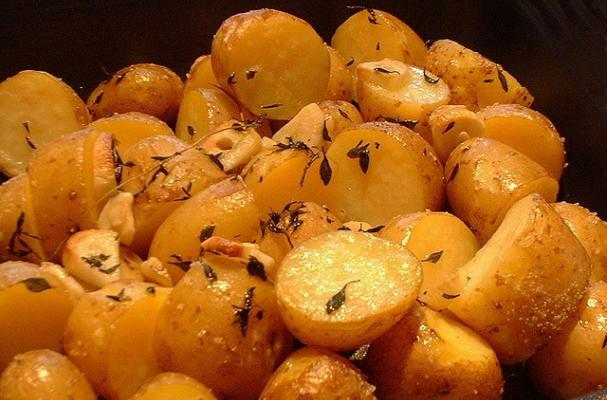 Roasted potatoes with garlic and rosemary will soon become a new family favorite. Preheat oven to 400 degrees. Cut potatoes into quarters or small, bite-sized pieces. Place on a large, parchment-lined rimmed baking pan. Drizzle olive oil over potatoes. Add garlic, rosemary, salt and pepper (don’t overdo it; you can always add more after roasting). Using your hands, toss potatoes to coat in olive oil and to distribute garlic and rosemary. Dot potatoes with small pinches of butter. Place baking pan in oven and roast for 25 to 35 minutes, or until potatoes are tender and browned. (I actually like them really browned, so I leave them in there for about 10 to 15 minutes more). Season with salt and pepper, if needed. This is one of my favorite recipe and for special occasions when my guests want a gravy, I have a quick easy secret for delicious sauce: any gravy from a packet: simmer about 2-3 ounces of red wine for 8-10 mins. then add your dissolve powdered gravy in. Simmer again for 4-6 mins in low heat.